A natural burial is the act of returning a body as naturally as possible to the earth. … Making the choice for natural burial means you are choosing a low-impact burial. It is a choice that reduces energy and resource consumption, and one that is less toxic. Image via Memorial Ecosystems Inc.
For a fully green burial, the body is placed in a designated natural area that is protected from future development. Sometimes a tree is planted on the grave. Typically there is no marker on the grave, although there may be a wall with name plaques at the entrance. The Denman Island Natural Burial Cemetery points out in this article that families of those buried in their cemetery “won’t be able to visit the burial location once the body has been interred. That’s to allow the forest a chance to grow back, over and around the deceased, undisturbed.” That’s a hard-core approach. One of the realities of land burial is that eventually the land is used up. Here’s an interesting article that gives you the flavour of an eco-burial. It also describes an eco-version of burial at sea, as well as a project to perfect a new method that essentially turns human remains into compost. Green burial is fairly new and available in only a few places in Canada at this time. However, within the framework of the current system, there are options that are more environmentally friendly than the traditional embalmed body placed in a metal-lined casket in a cement vault lining the grave. Skip the embalming. This is healthier for the mortician, the environment, and your pocketbook. City of Calgary cemeteries do not require embalming. Other cemeteries might. Regulations may require that the body be placed in a leak-proof body bag. Select a biodegradable casket. Usually this would be something made out seagrass or bamboo. Body size may be a factor in these caskets, so ask.Theoretically, a strong cloth bag or shroud could also be used, but not all funeral directors or cemeteries allow them. Specify burial directly in the earth rather than in a grave with a vault or liner. This is not a given. Some cemeteries require that the coffin be placed in a burial vault. This is a container, usually made of concrete, that fully encloses the coffin. Its purpose is to prevent the earth from sinking when the casket eventually deteriorates and collapses. A grave liner is similar but without the bottom. City of Calgary cemeteries do not require a vault or liner. Private cemeteries often do. If you own a plot, check what your cemetery allows. 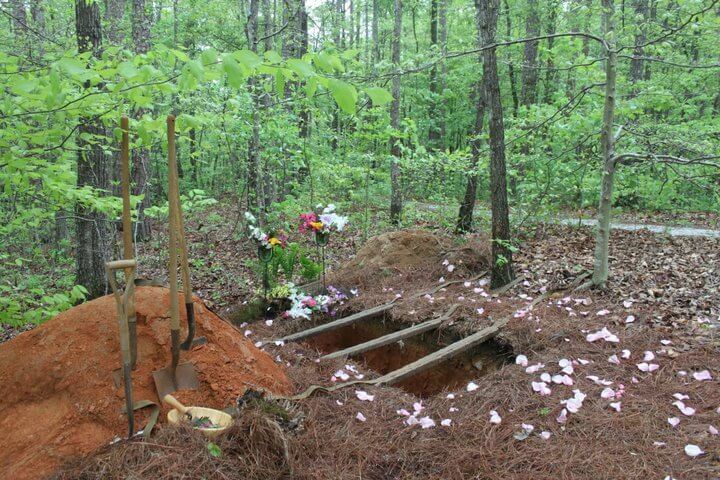 If you don’t have a plot, phone around to find out who gives you the option of being buried without a vault or liner. Not all funeral directors or cemeteries will accommodate these preferences. But ask, if you are interested in a more natural process. It’s only when we make our preferences known that options become more readily available. As economists point out, consumer demand is a big factor in the market. So exercise your consumer voice for what is important to you. You may die before the system changes enough to suit you, but it will help people down the line. the cost of pallbearers if you can’t round up six people to do it. Taking low-end prices for all of these adds up to about $11,000. This does not include professional fees and other miscellaneous costs. A green funeral will also incur a number of those costs, as you can well imagine. But you don’t need embalming, a vault, or an expensive wood casket. According to a very helpful and detailed price list on the website of Pierson’s Funeral Services, embalming costs $715 and liners and vaults are $1200 and up. You won’t need either. Likewise with a heavy, hardwood, lacquered casket. Pierson’s two environmental caskets are made of veneer and cost $2800 and $3100. 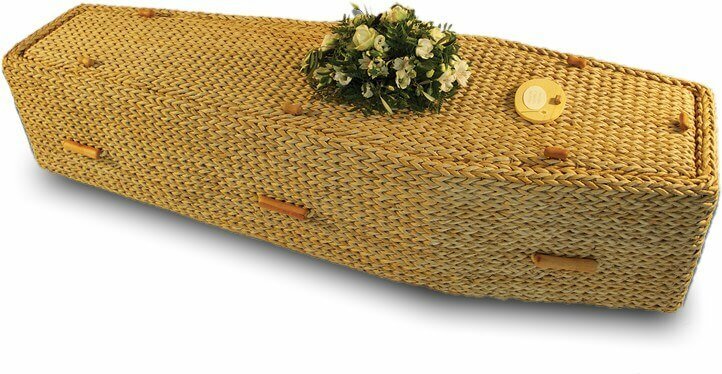 Bamboo and seagrass caskets are offered by Alternatives Funeral and Cremation Services at $2475 and $2250 respectively. There are too many variables for me to give you a definitive cost of either option, but I hope this gives you a ballpark idea as well as some things to be aware of when doing your own investigation. Please note that I have no experience with or connection to the sources used for these prices. They are two local places who have their prices listed on their websites. If you prefer a green burial, investigate what’s available (no need to prepay unless you want to), decide what you want, and leave your family your instructions. Why? Your family won’t have the focus or time to do research at the time of your death. So unless you specify what funeral home and which cemetery to contact, as well as what services you want, you will likely end up getting a conventional burial by default. If you are being buried, you need the services of both a funeral home and a cemetery, Start with a web search. Good search terms: (your town) cemeteries; green funeral services (your town); alternative funeral homes (your town). Once you’ve found some possibilities, look at their websites to “get the lay of the land.” Then call to see if they offer what you’re looking for. You might also ask if any new cemeteries are being built in the near future. When you’ve decided how to best get what you want with the resources available to you, put your instructions in writing. Review this with family members and give them a copy. Next week…cremation. Is there a green version? Can I access it? This entry was posted in Conscious Dying, Planning for death and tagged conscious dying, green burial, natural burial, dying, alternate burial, cost of dying by Laurana Rayne. Bookmark the permalink. Good to hear from you, Rae! Glad this was useful.